Hill tribe (Thai: ชาวดอย, ชาวเขา, คนเขา,, Thai pronunciation: [tɕʰāːw.dɔ̄ːj, tɕʰāːw.kʰǎw, kʰōn.kʰǎw]) (Northern Thai: จาวดอย, คนดอย, Northern Thai pronunciation: [t͡ɕāːw.dɔ̄ːj, xōn.dɔ̄ːj]; "mountain people/folk") is a term used in Thailand for all of the various ethnic groups who mostly inhabit the high mountainous Northern and Western regions of Thailand, including both sides of the border areas between Northern Thailand, Laos and Burma, the Phi Pan Nam Range, the Thanon Range, the latter a southern prolongation of the Shan Hills, as well as the Tenasserim Hills in Western Thailand. These areas are known for their often mountainous terrain which is in some areas covered by thick forests, while in others it has been heavily affected by deforestation. The hill dwelling peoples have traditionally been primarily subsistence farmers who use slash-and-burn agricultural techniques to farm their heavily forested communities. Popular perceptions that slash and burn practices are environmentally destructive, government concerns over borderland security, and population pressure has caused the government to forcibly relocate many hill tribe peoples. Traditionally, hill tribes were also a migratory people, leaving land as it became depleted of natural resources or when trouble arose. Cultural and adventure travel tourism resulting in visiting the tribal villages is an increasing source of income for the hill tribes, though its ethicacy is often debated. A 2013 article in Bangkok Post said that "Nearly a million hill peoples and forest dwellers are still treated as outsiders—criminals even, since most live in protected forests. Viewed as national security threats, hundreds of thousands of them are refused citizenship although many are natives to the land". 1 The term "hill tribe"
In the 19th century, the tribes living in the mountain ranges were the largest non-Buddhist group in Thailand. Their mountain locations were then considered remote and difficult to access. In Thai official documents, the term hill tribe (Chao Khao) began to appear in the 1960s. This term highlights a Hill and Valley dichotomy that is based on an ancient social relationship existing in most of Northern and Western Thailand, as well as in Sipsongpanna and Northern Vietnam. For the most part, the Dai/Tai/Thai people occupied the more fertile intermontane basins and the valleys, while the less powerful groups lived in the poorer, higher altitudes. This dichotomy was often also characterized by a master/serf relationship. Currently, Highland Thais is a more recent term also used to designate groups living in the mountainous areas. The seven major hill tribes within Thailand are the Akha, Lahu, Karen, Hmong/Miao, Mien/Yao, Lisu, Palaung each with a distinct language and culture. The Akha are closely related to the Hani of China's Yunnan province. They are also known derogatorily in Thai as the Gaw or the E-gaw. The Akha are one of the dominant cultural influences in the area. There are two to three million Akha and Akha-Hani in total, 70,000 of whom live in Thailand. The Akha speak a language in the Lolo/Yi branch of the Tibeto-Burman language group, but have no traditional written language. Although many Akha, especially younger people, profess Christianity, Akha Zang (The Akha Way) still runs deep in their consciousness. The Akha are a shamanic group that share the ancient universal archetype that the Goddess spins a universe where nature is not distinguished from humankind. They embody the essence of its consciousness into a holistic continuum where there is no dichotomy between themselves and the natural world. The Akha Way, a prescribed lifestyle derived from religious chants, combines animism, ancestor worship, shamanism and a deep relationship with the land. The Akha Way emphasizes rituals in everyday life and stresses strong family ties and the hymn of creation; every Akha male can recount his genealogy back over fifty generations to the first Akha, Sm Mi O. AFECT NGO (akhathai.org) is the oldest non-governmental organization for tribes in Asia helping to protect the deeply shamanic tribal culture. Akha Asia (akhaasia.org) runs an Akha cultural school. 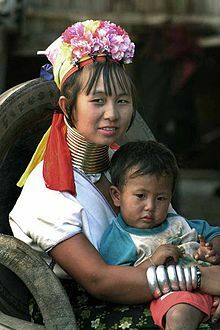 The Bwa G'Naw,(S'gaw Karen: ပှၤကညီကစၢၢ်ခိၣ်) known to many as Karen, and to others as Kariang or Yang, are one of the largest hill tribes in Southeast Asia. The total population of Karen people is unknown, since they are spread throughout Burma, Laos and Thailand, and no reliable census has been conducted in Burma since the 1930s. Population estimates range from 7.5 million to 14 million people. (The more conservative estimate makes their population equivalent to that of Switzerland). The approximately 320,000 Karen in Thailand comprise half of the country's total hill tribe population. The Hmong are believed to have been the original inhabitants of the Yangtze River in ancient China. The expansion of the neighboring Chinese from the north, caused a disruption in the Hmong culture and forced them to migrate southwards to Laos and Vietnam to escape oppression and persecution. Over the centuries, many wars have been waged against the Chinese. Greatly outnumbered, the Hmong suffered heavy casualties. The futile efforts to establish themselves as an independent people apart from the expanding Chinese led to their mass exodus further south of China, and eventually into Southeast Asia. From here, they made their way into the territories of the European colonies that later gained independence and became known as Laos, Vietnam, and Myanmar. While the Hmong came to inhabit the hillside of Thailand because of helping the Americans fight the Vietnam War and lost, the country had always maintained its sovereignty from the colonists. ^ English-Thai dictionary entry for "hill tribe"
^ Tumsorn, Maneewan; Chansiriyotin, Supaporn (1986). Northern-Central Thai Dictionary (Revised Edition) (PDF) (in English and Thai). Thailand: Peace Corps/Thailand. Retrieved 5 June 2014. ^ Geddes, W. R. (1983). "Introduction". In John McKinnon and Wanat Bhruksasri (ed.). Highlanders of Thailand. Kuala Lumpur: Oxford University Press. ^ Sturgeon, Janet C. (2005). Border Landscapes: The Politics of Akha Land Use in China and Thailand. Seattle: University of Washington Press. ^ "Trekking with Hill Tribes in North Thailand". www.alienadv.com. Retrieved 2016-06-02. ^ "Gallery: Thailand's 'longneck' women, a controversial tourist attraction | CNN Travel". travel.cnn.com. Retrieved 2016-06-02. ^ "The Akha". HillTribe.org. Retrieved 3 May 2012. This page was last edited on 3 March 2019, at 18:55 (UTC).